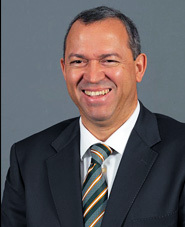 The President of the South African Rugby Union (SARU) and an alumnus of UKZN, Mr Oregan Hoskins, was interviewed by UKZNdabaOnline journalist, Raylene Captain-Hasthibeer for the NdabaOnline series, Spotlight on Alumni. Hoskins, who grew up in Woodlands in Pietermaritzburg, holds a BA, HDE and LLB from the former University of Natal. He read for an MBA at the University of Cape Town and has a certificate in leadership from the University of Oxford in England. Q: You’ve been President of SARU for a decade. What are you most proud of during this time? A: Several things including that I became President, that South Africa won Rugby World Cups at senior and junior levels as well as being champions at the Sevens World Series and the Commonwealth Games. We’ve kept the flag flying for South Africa and adhered to good corporate governance. Q: You’ve overcome adversity and have a slew of qualifications under your belt. What motivates and drives you? A: I lost my way in 1976 and became a school dropout. Deep down I always knew that my destiny was to pursue education even though I had failed myself. I wanted to be an inspiration for people who doubt themselves because others doubt them. Young people are my forte. I appeal to them and I relate to them. If I can make it like this, then so can others. The biggest challenge for us as human beings is to put our pride behind us and pursue our goals and dreams. Failure is only failure if we stop trying. I played rugby for enjoyment with my friends – we were never exposed to the game to the extent other more fortunate young people were. My achievements are thanks to everyone including my school and club mates who played with me and against me. I learned from them and became a leader because of them. Q: What advice do you have for aspiring young rugby players? A: There are no longer any legal barriers to playing at the highest level of the game. Players can make it with hard work and determination. Even the shortcomings caused by an unequal society that negatively impact on disadvantaged individuals can be overcome with sheer determination and belief. Most importantly, everybody must pursue education like we fought racial prejudice. Without education and training we are as good as living under the yoke of apartheid. A: The next chapter in my life is on the horizon. My term in rugby is fast coming to an end and I am exploring possibilities for the future. I have not decided yet what it will be. I believe in destiny and fate.